So holidays are finally here and you are all set to experiment various recipes to please your guests. Sometimes, stovetop is not enough to cook a lot of items at once. An electric skillet comes to the rescue with extra cooking space to prepare your favorite meals. These portable utensils ensure even heat distribution and you can cook many items at the same time. They are more than just for preparing holiday meals. You can also use them in camping and when you just don’t want to get your stovetop dirty. Also check my review for Best Cast Iron Skillet. About Electric Skillets – Electrical skillets have their own source to heat up. You don’t have to keep them on stovetop. You just need a power source. They are usually made of aluminum. But some also have stainless steel construction which is longer lasting. But they are costly. But both of them have a heating element. Even some include an option to detach the heat element. It can be very handy so you can easily wash them. Most of the electric skillets have non-stick interior as well as glass lid to see through. First of all, you may want to use them for frying and sautéing. Make your delicious pancakes and scrambled eggs or just sauté mushrooms or veggies. Some pans are also used to prep your roast beef, for baking and for grilling. You can also use electrical skillets for traditional cooking as an alternative to regular stovetops. But it is suitable for those who don’t cook much. If you have to cook just Sunday brunch, there is no need to turn on the gas stove and save fuel. It is a great substitute and is usually more cost-effective. You can use electrical skillet for more than just cooking. It keeps food warm and you can serve hot dish all the time. It is handy when you have cooked food but you suddenly get a call that your guests are coming late. You can also use it to cook your delicious meals outdoors. You can even take some meals along in it as an alternative to grill. Electric Skillet Buyer’s Guide – What To Look For? Size – Obviously, you will need a bigger skillet to serve large number of people. Usually, 12 to 16 inches of skillets are enough. If you want to serve small group or a couple, you may want to buy a 10-inch skillet or smaller. Shape – You should also count on shape of electric skillet, just like stovetop ones. It comes in different shapes to meet your needs. Rectangular pans are suitable for searing, cooking, and browning large amount of meat. Purpose – Do you want to deep fry or just fry your foods? To deep fry, choose an electric skillet which can resist heat up to 450F. Also look for deep skillet to reach high temperature to deep-fry foods. 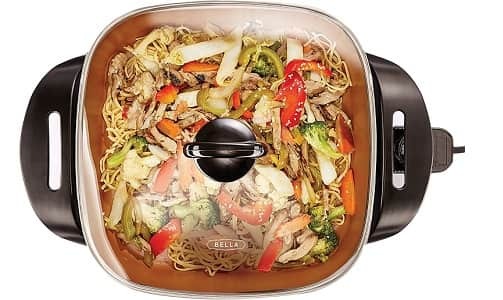 Lids – Choose skillets with lid and sides high enough to meet your cooking needs. Look for skillets which have higher sides if you want to deep fry the foods or cook stews or soups. You may want convex lid if you cook food which may peek out over the top. Storage – Consider where you are going to store your skillet after use. Be sure to have enough storage space to store them. They should also be easy to handle when moving from work area to your kitchen countertop. Look for appealing design if you want to display your electric skillet in your kitchen counter. Temperature Control – Consider the amount of temperature you want to control in your skillet. Skillets that come with bare bones controls are less versatile for low and high temperatures and they are also not good to perform precision cooking. If you generally want to cook stews and soups, you can easily work with simple controls. You may also find precise temperature controls and some with settings to keep food warm. Coating – Just like in case of frying pans, you will also find electric skillets with different coatings. Usually, they come with nonstick coating for easy food release. Teflon is used to keep food from sticking but there are some complaints about chemicals leaching to food. This way, ceramic coating is a safe alternative. Consider heavy base in electric skillet so it won’t get knocked off. Durability – Electric skillet should also last longer with proper use and care, just like other appliances. But some items last longer no matter how you care. For example, stainless steel lasts longer and resists daily wear and tear more than plastics. Glass lids are better than plastic lids. So, avoid skillets that have plastic lids as they are not much durable. Safety – Usually, electric skillets are safe if they are used well. You also need to be careful just like in any kitchen appliance. Some skillets have locking mechanism to easily move your finished dishes. You can also stay assured by avoiding spilling hot food by mistake. You should also look for cool touch handles to keep you from accidental burns. Presto 06852’s beauty lies in its glass cover which allows you to keep an eye on cooking process and you don’t have to open the lid to keep heat from leaking out. Its deluxe non-stick surface lets you to cook food with little oil needed. It is also easy to clean up. Cook delicious and hearty meals within no time with Presto 06852 electric skillet to serve multiple guests. The multifunctional Presto 06857 electric foldaway skillet can roast, stew, fry, bake, and grill your delicious food. It can perform all the pretty things with proper heat control that retains desired level of temperature. There is virtually no risk of burns. Despite having non-stick surface, you still need to be careful and use a bit of butter and oil. You can cook virtually anything you like in its 16” surface. You can also use it for buffet serving. The handles always stay cool for easy handling. It covers very little space and you can easily detach it from the base and store the handles inside. Non-stick coating is not much better. It starts to peel off from the sides in some cases. De’Longhi BG45 electric skillt comes with Teflon non-stick coating and is considered one of the most anticipated and quality pans. The coating lasts longer if it is used well. It has steam vent holes over the lid so steam can be released anytime while cooking with its adjustable vents. Steam comes out and lid might be loose. But it is blessed with adjustable thermostat that can be used whenever you have to check whether food is done. You can use it if you are a beginner. But it weighs 9 pounds and it is pretty heavy. Not good for those who move the pan too often. It is pretty heavy. Steam often comes out due to loosened lid. Hamilton Beach is one of the leading kitchen appliance brands. Hamilton Beach 38528 Deep Dish ceramic skillet is another great choice for your daily cooking. Its nonstick ceramic coating requires less oil to yield delicious and low-fat meals within minutes. It has guaranteed that it won’t peel or crack. So, it is a must-have appliance for your kitchen. It is another welcome addition to this list of multi use electric skillets. The best thing about this pan probably is its stainless steel body, especially when you don’t like aluminum. Steel electric pans are known to be very durable as compared to other skillets. Despite the fact that it is made of steel, it weighs just 4 or 5 pounds. It has smooth non-stick surface inside as it is the magic of Teflon coating. But the problem is that it is likely to flake off over time and it also has hot spots. So, you need to be mindful while cooking. Another thing you may not like is that it cannot be detached off the fleet and base. Make sure to have enough space before buying it. Though it is dishwasher safe after removing the probe, it gets stuck somewhere in it. Make cooking time even more fun and simple using Oster CKSTSKFM12-ECO DuraCeramic non-stick electric skillet. It comes with industry-grade nonstick coating which is 4 times more durable and is PTFE and PFOA free. It resists peeling and scratches and is the best choice to prepare stir fries or even fry your delicious meat. It is also a great deal as it comes at low price. It is a multi-purpose and affordable appliance for your kitchen. It has got cool touch handles and durable nonstick coating with glass lid and vent. It is both versatile and usable for your kitchen. Proctor Silex 38526 Electric Skillet truly deserves to be the treasured kitchenware for you. Proctor Silex is known to exceed its customers’ expectations. You can easily style your kitchen and prepare your food very conveniently as it needs far less washing after cooking. Make well-cooked breakfast to start your day with Cuisinart CSK150 1500W nonstick oval electric skillet that fits well to the countertop. It has proper surface area for eggs, sausage, and hash browns. It is easy to adjust temperature that is enough to fry your favorite chicken. It also has a recipe book for some inspiration and a glass lid to keep an eye on your meals. All in all, this Cuisinart CSK150 skillet is appealing and large enough to serve food. With diameter of 12 inches, Nesco ES-12 is an extra deep skillet which doesn’t take up much space on counter. It is extra deep for some serious cooking. All in all, it is a well designed product if you want to deep fry some dishes. Little small to prepare large dishes. The copper titanium coating is the beauty of Bella 14607 electric skillet as it is 8x more durable than common nonstick coating in other pans and it can resist up to 850F of temperature. It is also PFOA and PTFE safe and is resistant to abrasion. Its special coating makes the skillet stand out. It is also free from all hazardous substances. You can easily use it with various metal utensils and it is also competitively priced. Good electrical skillets have even heat distribution, which is something not common in regular skillets. Instead having hot spots, the whole skillet has even temperature. You can rest assured that food is cooked faster and more evenly. You can cook dish even faster using the lid as it locks all the heat inside. Well, it is up to the dimensions but they surely take far less space than common stoves. You can store electric skillet anywhere you like. You can disassemble it when not in use and store all the parts together in any small space. There is no need to spend much if you want to afford a decent quality electrical skillet. You can just spend up to $40 to buy best quality electrical pans. According to your usage, some skillets can last up to several years. They are also designed to be very reliable and durable. Always turn off the skillet and unplug it when your food is cooked. Don’t leave it plugged in or turned on to avoid fire. Don’t use it as a slow cooker. Don’t leave your food and go anywhere else. It heats up when it cooks food. Handle the lid with oven mitts and when moving it. Choose skillet with glass lid to see your food along the process. This way, you don’t have to open it up to see the food and let heat to come out. These electric skillets are the best examples of modern cooking as they can save you a lot of energy and time to cook delicious and healthy food with less oil. These skillets are literally worth every cent as they make your cooking whole lot easier. Which one to choose is totally up to your needs. We hope you enjoyed the buyers guide and our reviews on top skillets to make food faster.